Is your thermostat still being controlled by a lever? Have you thought about making the transition to a Wi-Fi thermostat? The use of Wi-Fi technology continues to evolve and play a role in our daily lives, so it's not surprising that Wi-Fi-enabled thermostats are being installed in most newer homes. With a Wi-Fi thermostat, your control over the comfort level in your home is enhanced, as is your ability to save significantly on your utility bill by programming an efficient temperature schedule. In fact, proper use of programmable Wi-Fi thermostats can help homeowners save up to $180 a year on their energy bill, according to ENERGYSTAR.GOV. When you install a Wi-Fi thermostat, you can control it from anywhere. Whether you're at work, or on the other side of the world, as long as you can access the internet, you can change the temperature. Let's say you're vacationing in balmy Florida, and you hear a snow storm is moving into Des Moines. No worries about finding someone to go over to your house and turn up the heat. You can do it yourself, right on your touch screen. These devices are also a great way to monitor conditions in your home while you're away. In the rare instance your furnace stops working, you'll get a report on it and can take action to keep pets, plants and pipes safe as you monitor temperatures inside and outside. Some people find operating a programmable thermostat to be difficult. If that sounds like you, take heart. A Wi-Fi thermostat makes setting temperatures a breeze. Once you've downloaded the app, you can just set the temperature and times for your climate schedule by touching the screen, and you're done. A Learning Thermostat can come equipped with sensors that learn when you're home and away so that the thermostat can adjust the temperature for these times automatically. Wi-Fi thermostats may also be capable of detecting when your cell phone is within a certain range so that they can turn the temperature up or down prior to your arrival. With a regular thermostat, it’s easy to set a temperature and forget it, only to remember when you get your energy bill. With a Wi-Fi thermostat, homeowners have the ability to see their energy consumption over a specific period of time which can help determine the temperature they should be setting their home. Furthermore, Wi-Fi thermostats’ ability to adjust the temperature automatically based on whether you’re home or not can be a big cost savings. Honeywell’s thermostat is a great value and is likely a better fit for small to medium homes. A homeowner can set a schedule directly on the thermostat, which has a large, touchscreen display. Plus, it can provide helpful information about the humidity levels in the home and what the temperature is outside. While we might be biased, we truly think the Lennox iComfort Wi-Fi thermostat gives the homeowner the most flexibility and options. You can adjust the temperature of your home from anywhere, whether it’s a few miles down the road or across the globe. Plus, the iComfort flex model can work other brands no matter which HVAC equipment is installed in the home. The one-touch away mode can help you save money by reducing the system output. When you return home, one touch will tell your home to return to its normal schedule. Aside from setting the temperature, it allows you to monitor and control the humidity in your home for perfect air quality. If you’ve made the decision to install a Wi-Fi thermostat in your home, you may be wondering how it works and how it will be installed in your home. Plus, how do you connect to your Wi-Fi controlled thermostat? A Wi-Fi thermostat contains sensors that are able to control a residence’s heating and cooling systems. With a wireless network, a Wi-Fi thermostat can be controlled with a smart device and an app, or on the thermostat itself. Most Wi-Fi thermostats have a large display for easy operation. Similar to how smartphones have sensors that enable them to know the temperature of your location or the speed at which you’re traveling, Wi-Fi thermostats also have access sensors that give them this data. The iComfort displays a five-day forecast for your area and will alert you to any dangerous weather. If you’re not a fan of the weather forecast, just upload a family photo as the touch-screen screensaver. 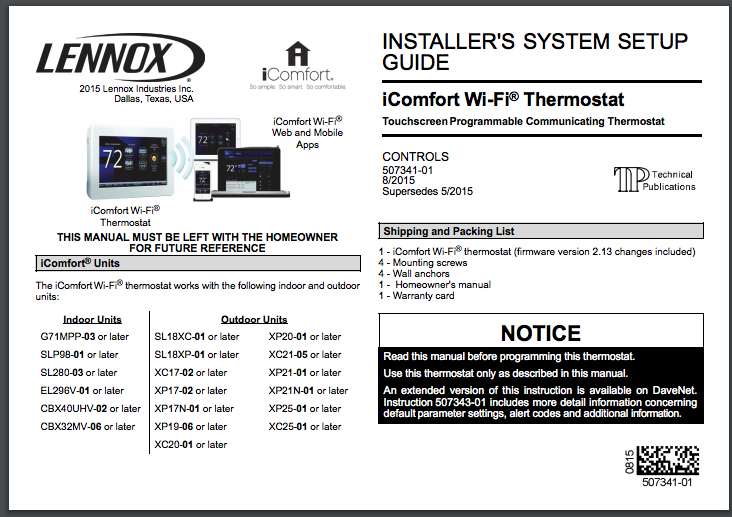 Looking for the iComfort Wi-Fi Thermostat installation guide? Find the full owner’s manual below. Depending on which device you choose, the way you connect to the thermostat may be different. With the Lennox iComfort Wi-Fi Thermostat, connection is done through your router in your home that you are already using for your other WiFi home devices. Interested In Learning More About Wi-Fi Thermostats? For more on the benefits of Wi-Fi thermostats, contact Lozier Heating & Cooling of Des Moines. Founded in 1906, Lozier is among the top HVAC contractors in Central Iowa. With technology ever-changing, we aim to stay on top of changing trends and to educate our customers in the greater Des Moines, Iowa area about what’s new in home comfort and energy, specific to HVAC systems.